A big thanks to everyone that came out for today's CFMeetup. The code is located here and the presentation is located here. While practicing for this presentation, I noticed a few things. After solving the problem for the 2nd time, I noticed my brain starting to tweak what I was doing. At first it was only a small change. 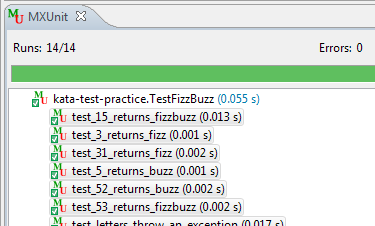 Then as I took another go at the fizzbuzz problem, I tried something else. My only guess is that a few things are in place to allow my brain worry about the how and not the what. The biggest thing seemed to be that I knew the answer to the problem before I started solving it. Just knowing that I had solved this problem but not 30 minutes earlier made it easier for my brain to think in another direction than "How am I going to solve this?". The other large contributing factor is the use of TDD. As I wrote each test and made it pass, I then had the freedom to refactor until I was blue in the face. No matter the size of the change, I only had to do one thing to check on the build status, run my tests. Earlier this week, I preformed a few of these practice sessions before I started my normal work day. Once I started my regular work, I noticed an immediate difference in my level of clarity while reading and writing code. The confidence given by solving a problem by 9:00am and knowing that it's 100% correct is unbelievable. Plus, doesn't this beat reading email? Ryan Anklam who had the original idea for this meetup. Ryan's coding portion can be seen here and the slides are here. Charlie Arehart who puts on a meetup that is priceless to the ColdFusion community.